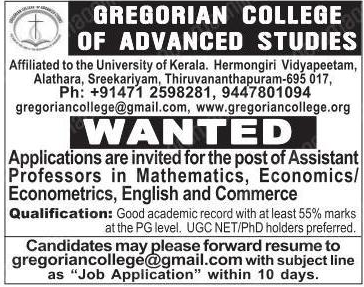 Gregorian College of Advanced Studies, Trivandrum has advertised in Malayala Manorama newspaper for the recruitment of Assistant Professor jobs vacancies. Interested and eligible job aspirants are requested to apply with in 10 days. Check out further more details below. About College: The word ‘Gregorian’ evokes the names of great saints of the church with name Gregorios, who lived a life of holiness and wisdom as the proverb says, “the Fear of the Lord is the Beginning of Knowledge”(Prov.1:7). Saint Gregorios of Nazianzus and Saint Gregorios of Nyssa were well known for their piety and scholarship. Saint Gregorios of Parumala and Saint Gregorios of Pampady were great men of holiness. Dr. Paulos Mar Gregorios was internationally known for his erudition and scholarship. Thus the adjective Gregorian has come down as a synonym for both devotion and knowledge. And thus it indicates that the college stands for the noble objective of value based and holistic education envisioned by the great saints of church. Again, these great saints of the past are present with us today and are our great intercessors.